The PNC is grateful to the 14th PBNC organizers, who obtained permission to use these presentations from all plenary session authors. As a result, these papers are presented with the permission of their authors. Note: Opinions expressed in the following papers and presentations are those of the author and do not necessarily reflect the opinions of the PNC, its member organizations, or of the organizations with which the authors are affiliated, nor should authors’ viewpoints or identification of materials or products be construed as endorsement by the PNC or by its member organizations. Some papers are represented only by the audio-visual package used by the speaker and written papers are not available. All files are in PDF format requiring Adobe Acrobat Reader. 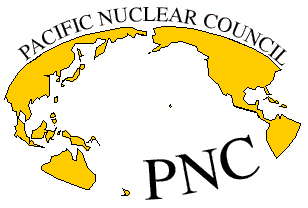 © 2019 Pacific Nuclear Council.